China - Possibly the first heimishe wedding in China since World War II took place today at the Marriot in Shanghai as a New York businessman married a Belgian employee of a high tech company. And indeed it was. Approximately 150 guests from various locations including New York, Skver, Antwerp, Israel and England flew to China joining 200 members of the Shanghai community for this landmark event. 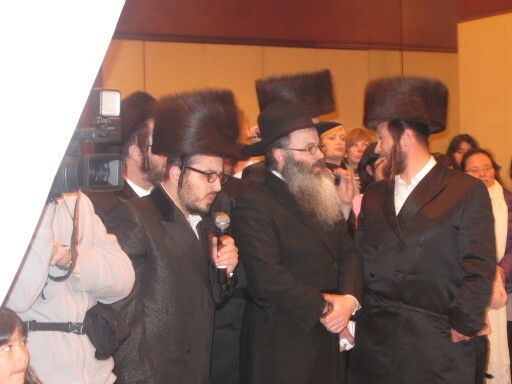 The wedding was catered by R’ Shulem Greenberg of Chabad, with R’ Akiva Asher Padwa head of the London Beis Din and a frequent guest of Lauber’s serving as Mesader Kiddushin. 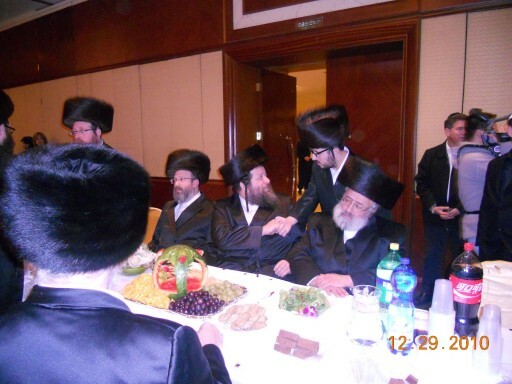 Entertainer Lipa Schmeltzer was flown to Shanghai for the wedding as a gesture of hakaras hatov by a group of businessman who have enjoyed Lauber’s hospitality over the years. Schmeltzer was one of only six people who managed to get onto a Continental flight out of Newark when his flight was cancelled due to the blizzard. Mazal tov!!! Till 120+ together , with simcha and nachas l'rov, Hashem bless them for all the good they do in that far-away place. In Shanghai?! I don't understand! Where does he have a minyan? A mikveh? Kosher food? Where will he have chinuch for his children? wow my friend went to this wedding. its amazing. That is a major "Miser Haskel" that hashem is siting since the begining oif the world & is Mazaveg Zivigim..
you are only worried for his yidishkeit not happy with his simcha??????? Is that sushi and egg rolls on the table? It's chasunah meets dim sum. Mazel Tov! Mazel Tov! Ari & Reizy!!! We are all rejoicing in your simcha from far. We are so excited that our uncle made the headlines!!!! Poster #2, there is kosher food and minyan all year round. Not to worry. There is a wonderful chabad rabbi too! BH, whoever from the family was planning to go, got there, even if the flights were originally cancelled, they all made it there on time! We are so happy for the new couple. Actually there is a minyan by R' Shulem Greenberg (aside from the other shlichim in shanghai) and they have a mikveh, kosher food establishment in the highest of standards. Go there and check 'em out! please open a skwerer shtibel ! and lmaan hashem never forget to wear your shtivel !!! Mazal Tov Ari! Ephraim Yurowitz here. You remember me from back then before you became such a Chinese regular? You remember the China Hotel in Guangzhou? Where was my invitation? I would have, could have been there! Kosher food? A Minyan? A Mikveh? Come one you guys, take your head out of the sand or snow of Boro Park just long enough to realize that Brooklyn is not the only Jewish community in the world! Do you know that there is a Cholov Yisroel Pizza shop in Hong Kong? Do you know that the Rebbe in my Shul in Monsey wont eat meat bought here locally from some stores but told a fellow traveler that he can eat from any Chabad in China? Mazal Tov again Ari and Reizy! My current understanding is that there is basically only a chabad there. Just like in china. Isn't this chosson - kallah hewimish?? They go to chabad?? They eat chabad food?? They use a chabad mikveh?? I thought chabad in those hick places are for only for the non religious! To #14- Why did you refer to Shanghai as "a hick place". There are over 10,000,000 people who live there. During WW2, many Yidden found refuge and safety in Shanghai, and lived there for the duration of WW2, until 1949, when they emigrated to the USA, Canada, South America, and EY. How many people live in Des Moines Iowa? I think that if we would fargin one another Mashiach would come! That's not fair. They both live there. Who says it was a fancier wedding than it wouldve been somewhere else. And it produced a big kiddush hashem. don't you know that there is a chabed house over there ? He has the same minyan and kashrus your grandfather had in his shtetel in Europe! not everyone lived amongst Jews, and if you live far from a shul there's no chiyuv to daven with minyan, learn your religion before you preach it. mr dor, it deems that you are unaware but heimishe yidden frequent chabad houses all over the world whether travelling for buisness or pleasure. Ari and Raizy, We are so happy for you!!!! We all want to wish you lots of good mazel, bracha, gezunt and happiness! We would have love to have been by the wedding!! Welcome to our family Raizy! Mazel tov from part of your Nieces that stayed behind! Maybe the single girls in NY who can't get married should go there to get married! By the way, I'm going to tell you a cool story. One time, when I was living in China, I went to a village that was totally isolated from any western influences or any kind. There was a little old man, writing chinese calligraphy. I pointed to his feather pen and to myself, so he handed it to me. I wrote "shvoich chamascha al hagoyim..."! He looked at it and shrugged, then his whole block came out to see this strange language, so I told him in chinese that "I'm Yotai ( a Jew)". He said "Yotai?" and rubbed his thumb and forefinger together, the sign for money, and then gave me a thumbs up!! GODOL HADOR The problem with you is that so many other self-aspiring Gedoilay Hador actually think like you. They sit in their high towers in Bnei Bark or Lakewood and shoot from the hip. But when they find themselves stranded or in need and Chabad is on hand, then.....only shhh don't tell anyone. It could ruin my chances of being the next official godol hador! Meanwhile it is a fact that the Satmar Rebbe invited the Shanghai shliach (Rabbi Freundlach) to his tisch and to sit 'oiben on' with him in appreciation for everything he does there for his chassidim that travel through. Yes even Satmar and Chabad. Now if only we could get you litvishe "war mongers" to start practising some ahavas yisroel, we'd all be in a better place. “ GODOL HADOR The problem with you is that so many other self-aspiring Gedoilay Hador actually think like you. They sit in their high towers in Bnei Bark or Lakewood and shoot from the hip. But when they find themselves stranded or in need and Chabad is on hand, then.....only shhh don't tell anyone. It could ruin my chances of being the next official godol hador! And...although I am a Gododl I'm not Litvish. My whole point ladies and gentlemen was, in fact that in these places, which aren't remote anymore. Chabad IS Judaism, regardless of its relentless critics. first of all, be serious. this is not a hick place. i'm the daughter of the shliach in china AND I KNOW MY FATHER!!!!!!!!!!!!!! don't you have a mind??? ?/ the rebbe sent us here so ANY person who comes, heimish, chabad, or non-religous, have a place to davven, eat kosher food, etc. and we also have a jewish school here. YOU'RE INSULTING THE SHLUCHIM!!!!!!!!!! please try to be more nice next time!!!!!!!!!!!!!!!!!!!!!!! Any Jew that ever traveled the world will know to appreciate the gadlus of the chesed and kiruv that Chabad does. And you know what, it is not only to those none religious Jews who know nothing and open their eyes when they come there. It is every single Jew, chasidish, litvish, religious and none religious. Chabad is there with open hands and arms, ready to feed you with whatever you need beruchnuious and begashmious. Mashgichim from all hashgoches eat there, and I personnaly saw them eat in Chabad in Shanghai, not just the food, but the meat too. Just remember one of the korbonois in Mumbai was also a mashgiach from the Edah Hachareidis. And all those people that go there, know the chashivus of Chabad and they appreciate them. It is those that sit at home, and know nothing about what goes on, those are the ones that talk and give their opinions that that are totally not relevant. I personally wish all the shluchim all over the world, Hashem should be with them and give them everything they need, because they are giving themselves away for the tzibur. And I wish Ari and Raizy all the best till a hundred and twenty, a life full of happiness.